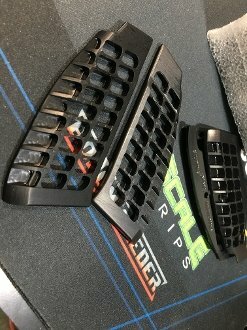 The “Scales” grips got spikes. These sharp square micro lugs will dig in for the ride. This change has been requested for those hot sweaty conditions. Soft keyboard hands need not apply. The grips are finished in Black Nickel... Or what old school kids called black chrome. If you are looking for that next big thing to improve your shooting ability and overall control of your race pistol look no further than the “Scales 2.0” as it will steer you to a new level of competition! 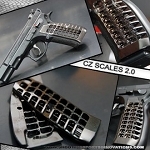 - The grip length was set for the CZ factory Czechmate magwell. - The unique scale design provides “extra” grip by allowing your hand to flow into the pockets, locking it in. 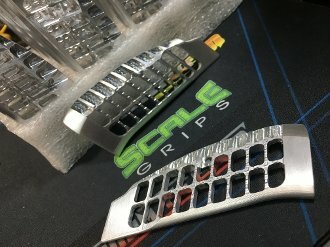 Install notes: Scale grips are produced for a very tight fit. Clean your frame of any carbon or thread locker build up. Primarily check that the angled face that locates the front of the grip is clean. When installing the screw, press the grip forward to ensure screw clearance to the frame. Insert your screws and check that it will thread in. Do not proceed if the screw isn't a perfect 90 degree angle. Only when the screw goes in perfectly straight should you proceed with the screw installation. Please do not cross thread your frame or over tighten the screws. FYI.... due to manufacturing processes, frames may have the fastener locations in different spots left vs right. If you are not comfortable slotting the Scale grip screw hole to alow the screw to go in perfectly straight, seek the assistance of a qualified gunsmith. Check that your screws are tight after and during your next match. Blue thread locker on your grip screw is recommended. No liability is expressed or implied for damage or injury which may result from improper installation or use of this product. Shooting Sports Innovations stands behind all of its products. If you have an issue, let us know. However, firearms are inherently dangerous and must be treated with respect at all times. Please make sure you are fully familiar with your firearm, how to use it safely, and that you follow the four rules of firearm safety at all times. Shooting Sports Innovations cannot and will not be held responsible for any negligent use of any firearm or Shooting Sports Innovations products.